Home / blog / Facebook News Feed Changes & How they Might Affect You as a Business? Facebook’s CEO & Founder – Mark Zuckerberg announced in January that they are making changes to the news feed algorithm to now enable more peer to peer conversations rather than showcase ads. This has come as a surprise to investors in the wake of Facebook being the best social platform to run targeted ads & it has taken all of 14 years to reach this stage. Why now is it turning its back on advertisers who are willing to pay the price to run their ads on Facebook rather than minting money? Let’s understand first about What News Feed is & then more about if this change is good or bad for your business as an SMB. As soon as you logged into Facebook with your personal email id & password, Facebook takes you to “Home” rather than your personal profile. Once logged in, you will find a vertical scroll page which displays different posts from your friends & Facebook groups that you are part of. This vertical scroll page is called as the “Newsfeed” on Facebook as it displays all the news that you are willing to look at, “Be it Friend’s birthday posts”, “Posts that were shared by your friends from their profile containing photos & videos”, “Posts people have published on the Facebook Groups that you might be part of”. 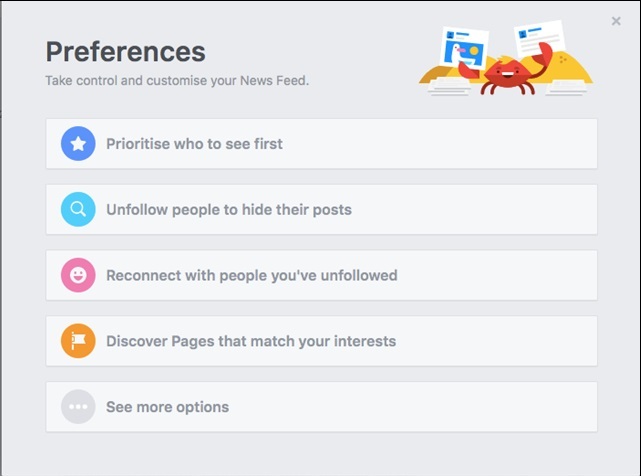 Not many are aware that you could actually define “News Feed Preferences” so that you can prioritize whose messages you want to see first when you login into Facebook. Previously no such options were available but Facebook launched this feature so individuals can customize their newsfeed by prioritizing which post or news is more important to them to be served early in the morning. There are 2 ways to access News Feed Preference Settings. 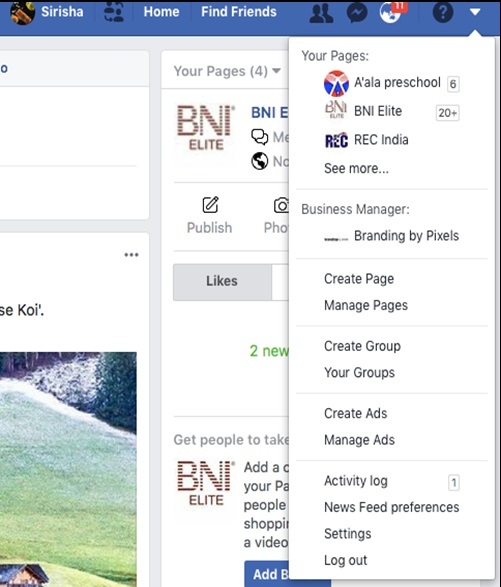 Using these preferences you can suggest to Facebook whose posts are more important to you, set up business pages that interest you so whenever that business page posts something on their page you will find it in your news feed as you have set those preferences here. One more easy way to set News Feed Preferences is from your personal profile options that you can find to the right of the page. Right above settings, you will find the option for “News Feed preferences”. When you click on it it will open up a small window as above to allow you to set preferences for your personal News Feed. 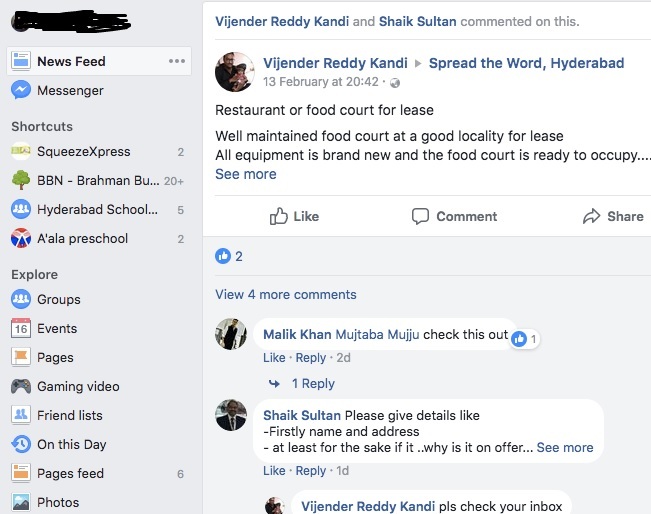 Now that we understand “News Feed” and how we can set it up so we only see the most important posts from our dear friends and can get most relevant information from businesses that we are interested in by following their Facebook pages lets understand what change has been made to the News Feed algorithm by Facebook. On 12th January 2018, Mark Zuckerberg, Founder & Chief Executive at Facebook announced to the world that Facebook News Feed is going to change now to “showcase more posts from friends & family” is expected to be de-cluttered from posts of advertisers. One reason for this announcement that most of the world did not know was “Facebook ultimately found its right competitor” – its none other than “Facebook itself”. Facebook has evolved over 14 years and is the most sought-after social media platform by Advertisers & Marketers due to the evolved targeting options that it provides like Demographics, Age, Location, Interests, Life events etc. for low costs which in turn provides the highest ROI that is not comparable to any other social media platform out there. This led to a high number of ads on Facebook and thus cluttering of News Feeds of the users of Facebook like you and me. So, users mostly younger ones have been leaving the platform and are joining new social media platforms like “Instagram”, “Snapchat” etc. where the probability of a friend’s post reaching them is higher. Facebook has been seeing this change for a year and wanted to stop users from leaving the platform, hence the change in News Feed algorithm. How does the News Feed Algorithm change effect YOU if you are a MARKETER or an SMB? Now that Facebook is going to showcase a lower number of ads on News Feed it would definitely affect you as a marketer. But not everything is gloomy in that part of the town – if you have been a serial marketer and have only focussed on placing ads and mastering targeting now is the time to start engaging with your client’s audiences on their business profile page and actively start sharing organic content. Engaging with your client’s business profile users is the way to get more organic reach & creating interesting content will help you create vitality organically. Now is the time to create lots of visual content like videos mainly regarding your client’s business as videos are booming on Facebook now. So, go ahead and hire an Experienced Visual Content developer like us (Our works) to create interesting videos for your clients. If you are an SMB, trust us when we tell you that this news is a blessing in disguise for you. 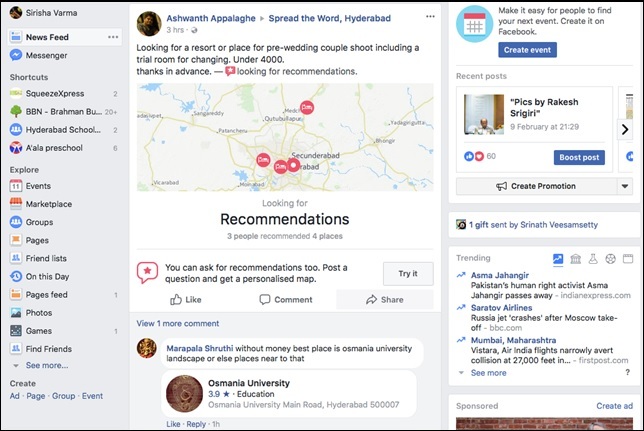 Now, all you need to do is to create interesting stories about your company or product and see that you constantly share these with your customers on Facebook as it would be easy to reach more of them now. If you have not thought of Facebook as a means to market your brand, now is the time to rethink of your strategy. Send friend invites to your Customers & invite them to like your Facebook Business Profile and start engaging with them TODAY. Create & Share Videos on “Product making”, “Brand story”, “Your Business Journey”, “Customer Testimonial videos”, “Celebration videos” etc. make sure you don’t miss out on any opportunity to create & share content. If you are looking for an experienced Visual Content developer to create these interesting stories – reach out to us at Branding by pixels we can help create interesting content that can be shared on Facebook or other social media. We all LOVE our Friends and our Facebook Groups. They are one of the reasons we constantly check our Facebook feeds and are so engaged on social media, no wonder 1 minute out of 5 minutes spent online is spent on browsing Facebook or Instagram. We constantly stay connected with them, we smash the “Like” button whenever our friends post a picture or share a video. That is until it becomes too much to bear! We have all had those moments in our lives when we are super busy or have to put our heads down to reach our goals or have reached a place in our friendships or relationships where we would like to take a break from our current network to gather our thoughts. 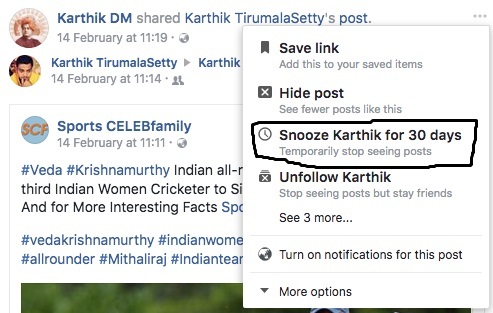 That is exactly the new option that Facebook is providing its users, its rightly called “Snooze”. Its a feature which Facebook has included to give its users power to stop seeing posts from specific friends or content from certain Facebook groups on their News Feed for a specific period of time rather than “Unfriend” or “Unfollow” them. This feature has been in the works since Fall where Facebook tested how much time of a break might be the right option by providing different options to their focus groups and they have decided that “Snooze” ing for a period of “30 days” is good enough. This is not entirely a new feature, previously if you wanted to stop seeing posts from specific friends or Facebook groups you could “Unfriend” them or “Unfollow” them in that order but then you would have to consciously “Friend” them back or “Follow” them back but use “Snooze”, after the time period of 30 days its expected that automatically Facebook will start showing that friend’s or Facebook group’s messages to you without any additional interference from your side. This feature comes in the wake of Facebook announcing to provide more user-friendly content wherein the friends to friends content will be much highlighted on the newsfeed rather than advertisements that have been cluttering the newsfeed for long. This shows that Facebook is serious about maintaining stats of being the world’s biggest social platform with 2 Billion users currently being on it and making sure that its users are engaged enough to continue being part of its platform. 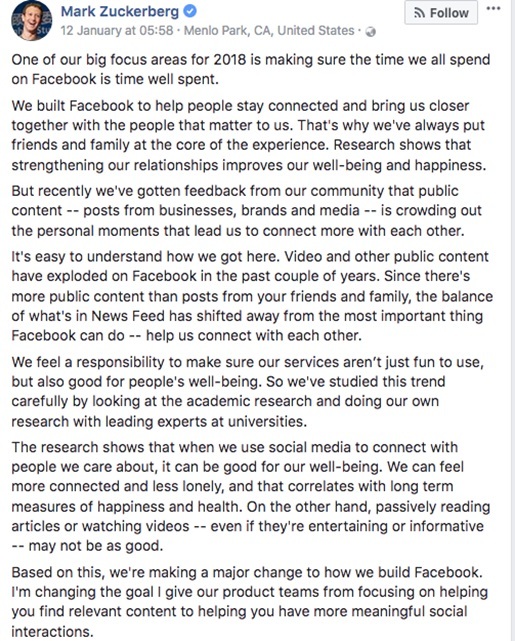 In Conclusion, Facebook has gone back to its root philosophy of creating meaningful communities because Mark Zuckerberg understands that building a community is more appropriate even for businesses rather than just creating a platform that looks at a quick buck using ads. If you are a Business Man/Woman what are you doing to create a Community for your Business? Having Loyal, Engaged Clients is not just good for the business but it’s great to be a celebrity on social media as it fulfills the “Feel Good” factor too as being an entrepreneur is a lonely journey. Using Visual Content (Learn Why Visual content is important) to create a Community is the best way forward. Reach out to us to create interesting content for your business contact us. Let’s start the discussion TODAY.